Add value not confusion when you make design changes! 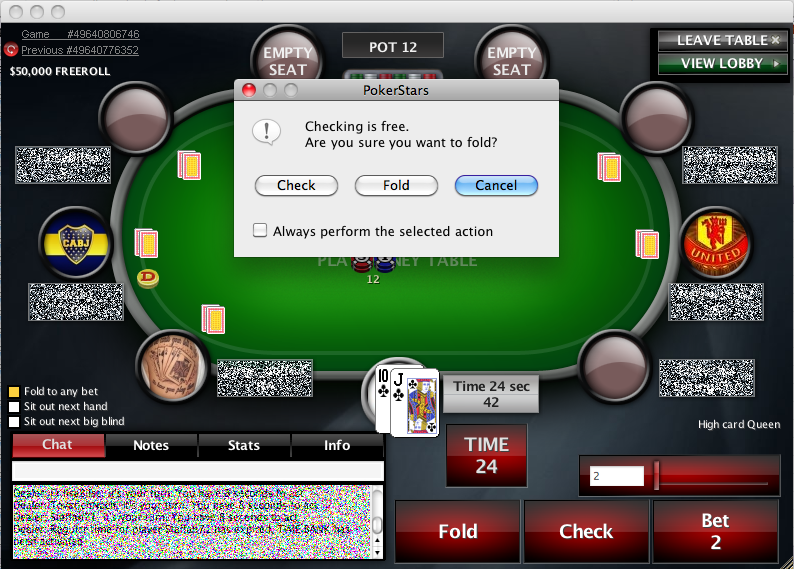 PokerStars made a design change to the alert shown when you click on “Fold” (as you can see in the image above) a while ago. I did a “Redesign in 20 minutes” about PokerStars “Check” and “Fold” buttons back in November last year. The new design didn’t address any of the issues I wrote about in my blog post and I am not so sure that the new functionality is better than it was before. For instance what happens when you check the “Always perform the selected action” checkbox and click “Cancel”? What will happen the next time I click on “Fold”? Do I get the alert or not? And if you have selected the checkbox? How do you get the alert back? In the settings? If you select “Always perform the selected action” and choose “Check” as the action then you could actually remove the “Fold” button from the main window. I think the checkbox adds confusion instead of making it easier for the player, and I also believe that my redesign would have worked better.